I can review videos of your pole bending runs. I can capture individual frames from your videos and then provide written comments that explain what I see in each captured frame.. I build a file in Adobe Acrobat (.pdf) format that includes the video frames and my comments. I'm convinced of the value of this learning method. We regularly video our own pole bending runs and then use slow motion and stop action to identify problems. I have found it to be invaluable for detecting and correcting problems with both the horse and the rider. The camera does not lie, and you will find that the comments add insight and real help. You can view a sample video lesson. Give it a chance to load - depending on your Internet speed, it could take a little bit - it is a pdf file. View it here>>. I am so amazed and excited about all that you had to teach me! Your comments with being able to see my body and my horse's position were excellent! I have been to quite a few clinics for barrel racing and I still don't think I have learned as well as seeing your lessons. Being able to stop the action is so helpful. Your instruction makes so much sense ... it has me feeling more knowledgeable and very excited for our coming season! You have a talent for being able to see what both horse and rider are doing and can convey that in easy to understand language. Thank you again! Yours for better horsemanship, S.
Ken, Just got back in town and looked at your material tonight. EXCELLENT feedback for my daughter. I'm excited to review it with her tonight. If she'll apply your feedback (and I think she will) it will really improve her runs. Thanks so much. I am very pleased with your work. We'll let you know her progress. I would like you to provide me videos of 2 or 3 runs. It would be helpful to see at least one run from the side and at least one run from the end, but that is not a requirement. See the section below on advice for the camera operator. Don't be bashful about showing me runs with mistakes that you know need correcting. After all, that is what we are trying to fix. I can work with a YouTube video, or you can also attach your video files to an email. I can also work with a DVD, or even a USB drive. If you send a USB drive, I'll return it. YouTube and emailed videos will cut down your turn-around time, because you don't have to wait for the mail. Note: Some cameras that record directly to DVD require you to perform a type of CLOSE operation in order for it to be readable in other devices. If you choose to use a DVD, then please try it in a DVD player before you send it to make sure it plays. If the runs you want to provide me are already videoed, then I will work with the quality you have, however good it is. But for future reference, you will want to record the runs at the highest resolution possible, as that will provide the best quality. I am getting more videos all the time that are made with cell phones or tablets. I can work with these, but be aware they have the disadvantage of not having a zoom feature. If the horse and rider get too far away from the camera, it becomes difficult to see what is actually happening. If you do not have a zoom feature, then it is best when possible to video from the side. Please refer to the camera advice at the bottom of this page. The price for a video lesson is $29.95 US. You can purchase using Paypal (click on the Buy Now button) or with a personal check or money order (see below). Paypal is handy if we are working with YouTube videos. First a few general comments about video cameras. Tablets and cell phones have no optical zoom capability, and therefore they do not work as well as an actual video camera for analyzing. However, often it seems a cell phone is the only option available. Whenever you video with a cell phone or tablet, ALWAYS hold it on its side (landscape mode) so it is wide, so the shape of the image matches your TV screen! And note that videoing from the side of the pattern is better for cell phones due to their lack of a zoom feature. 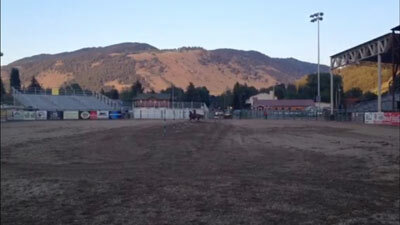 Note the tiny horse and rider in the frame on the left, from a video taken with a tablet. 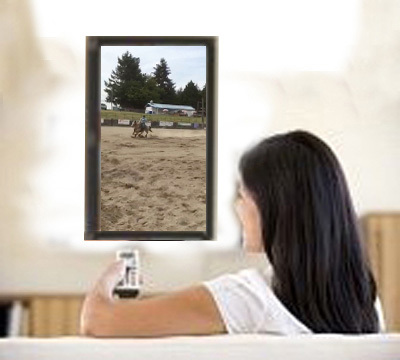 Here is the same frame using a computer to zoom in on the horse and rider. Note what this does to the image quality. 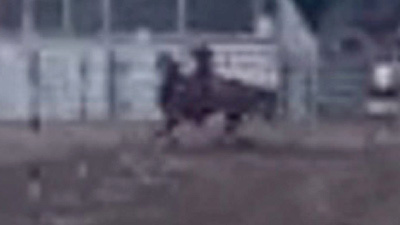 We can see the position of the horse, but we cannot see what the rider is doing with the reins. Here is an example of a frame recorded with a video camera, utilizing the camera's optical zoom feature. Note the obvious clarity compared to the tablet frame. Tablets are really convenient, but because they have no zoom option, they are not as good as a video camera. We can use tablet videos for video lessons. But the clearer the image, the more we can help. Where is the best location for the camera operator? There are optimal locations for the camera, depending on what we want to study. I like to see runs videoed from the side and from an end. The side view will show the horse's strides and turns, and the end view will show the rider's reining and the horse's flexion, and whether the horse is staying on the ideal track. Generally, the most helpful side position is on the side near the middle of the six poles. Adjust the camcorder zoom so that you can see a little more than two poles, maybe three, in the frame. 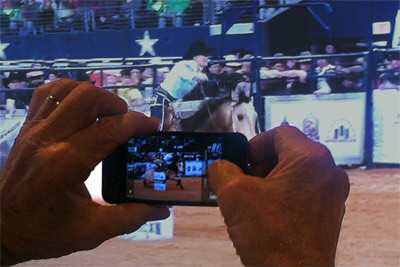 That will capture all of the horse and rider, and give you the needed perspective as they go through the pattern. 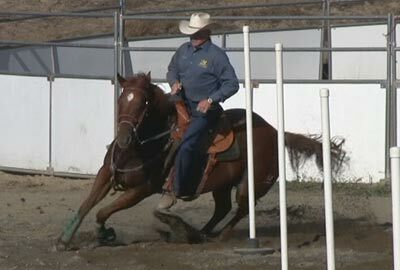 To best see how the horse and rider accomplish their turns, I prefer to be on the side where the horse will turn the end poles toward me as I'm videoing. I also like to see runs from one end or the other. From that position, I like to be slightly to the side so that all 6 poles can be seen in the run. That would be about 5 feet or so off the pole line. When videoing from the end, the zoom capability of a real camcorder is very helpful. Try to keep the horse and rider in the frame, neither too far away nor so close that we can't see what is happening. then you would want to video by holding your cell phone vertically. That is what is called portrait mode. 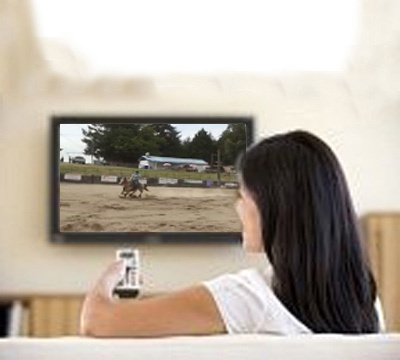 But chances are your TV is set up in the normal horizontal position like this one. Now if you video by holding your cell phone vertically in portrait mode, this is what you will see on your TV. then you will want to video by holding your cell phone on its side, in landscape mode, so the screen is wide. That will get you the good results shown here. Movie screens are wide. TV sets are wide. 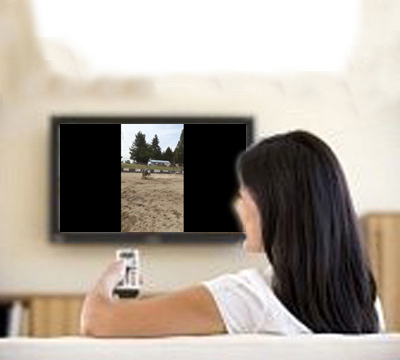 We humans have been programed to expect a wide screen view of video. So ... when videoing with a cell phone or tablet, always hold it in landscape mode, on its side, so it is wide.